Team Sleep, the influential group featuring members of Deftones, Crosses, Death Grips and more, are reuniting to record the long-awaited follow up to their self-titled 2005 debut. In a unique opportunity for fans, the band is offering an exclusive look at the recording process. 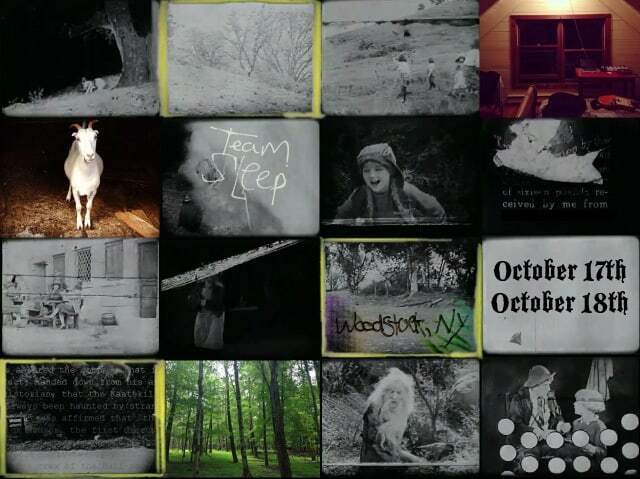 On October 17 and 18, Team Sleep is inviting fans to Applehead Recording in Woodstock, NY as part of the Woodstock Sessions series for a listening party of the new material, a Q&A session with the band, a live performance, a meal with the band and much more. Fans will receive recordings of the live performance both digitally and on vinyl, a CD of previously unreleased material, exclusive merchandise and more. Tickets are now available here. Throughout the autumn, Team Sleep will record new material to be released in the coming year, more details to be revealed soon. To hold fans over in the meantime, the band has unveiled two previously unheard snippets of tracks entitled “No” and “Dreamland,” available for stream. Please join us as we create our next record in Woodstock, New York. We’ll gather at Applehead studio, near the base of the Catskill mountains to eat, write, play and record. For a long time, business people, logistics, careers, adulthood, families and the House Republicans have thwarted us, but we’ve continued to make music. At the same time, the creative process has become increasingly fragmented and dehumanized. With that in mind, we’re very excited to get together with our friends, hang out, play music and have a unique experience in a beautiful place. We’d like you to be there, too. Your participation will be essential to the independent creation and release of the live performance and our forthcoming studio record; we look forward to seeing you.